This Italian sausage and tortellini soup recipe is creamy, comforting, and easy to make with very little prep time. This recipe was originally published on November 28, 2017. March 2019 update: I re-worked this recipe a bit to make it simpler and even tastier! 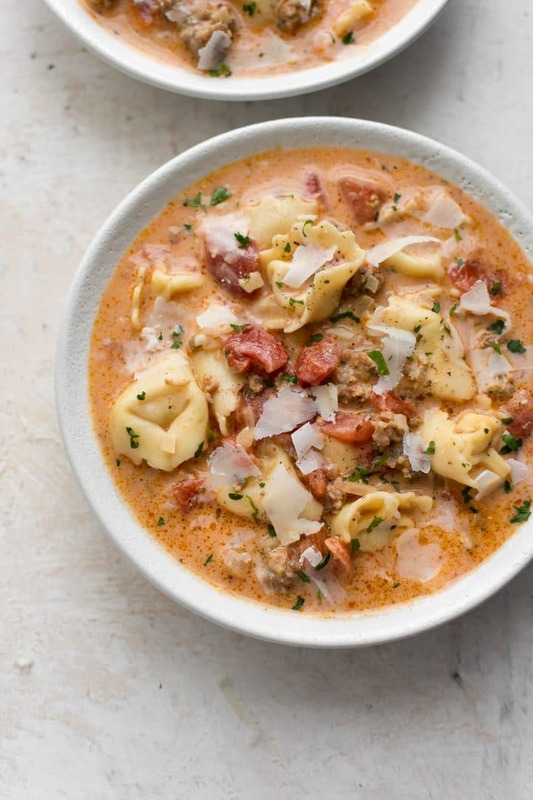 This cheese tortellini soup with sausage is the perfect comfort food. 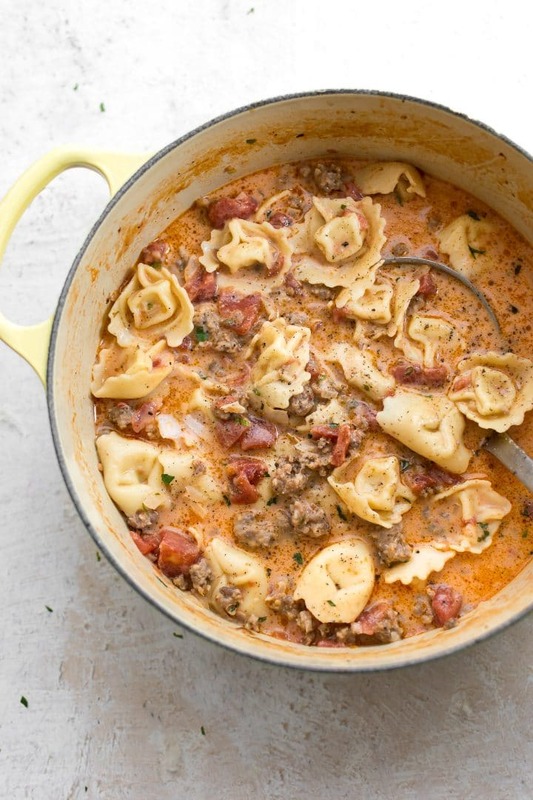 Italian sausage and tortellini are a great combination, and the creamy tomato broth is absolutely delicious. This is one of those recipes that will warm you up from the inside out. It’s not quite spring here yet, so I definitely don’t mind making more soup! One of the best things about this creamy sausage tortellini soup is that you don’t have to spend much time chopping stuff. Chop the onion, crumble the sausage (or use sausage meat), and that’s pretty much it. I find chopping relaxing, but not when I come home from work and I’m starving. Cooking this creamy tortellini soup is very simple… sauté the sausage, drain the grease, cook the onions, then add the rest of the ingredients in at various intervals. All in all it takes about 30 minutes or so. I’ll say that the leftovers for this soup are decent. The tortellini does go a bit mushy the longer it sits in the soup in the fridge. I found the next day to be fine, but 2-3 days after was pushing it a bit. I added a bit of shaved Parmesan cheese for the photos, but that’s totally optional. If you like this soup, you may also like my creamy chicken tortellini soup, this vegetarian tortellini soup, my Crockpot sausage tortellini soup, my tomato tortellini soup recipe, or my creamy tomato gnocchi soup. I hope you try this tortellini sausage soup recipe! 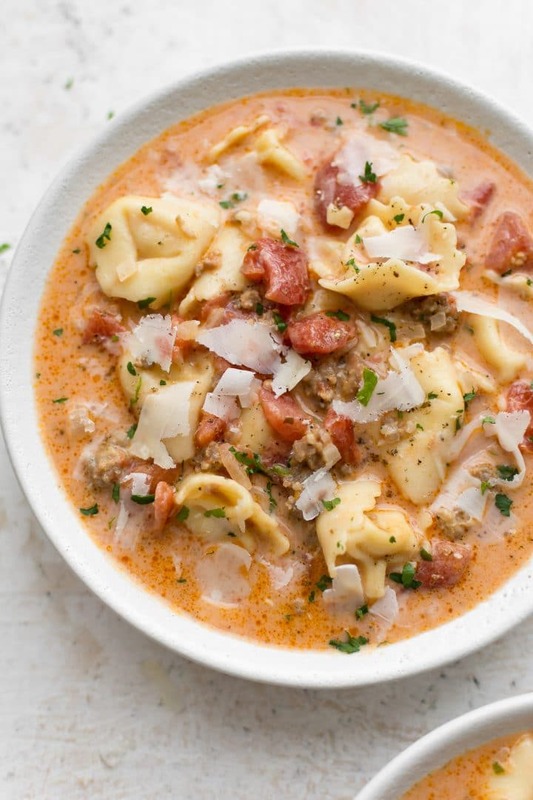 This Italian sausage and tortellini soup recipe is creamy, comforting, and very easy to make with very little prep time. Add the sausage pieces to a large soup pot over medium-high heat. Sauté, stirring occasionally, for 5-7 minutes, or until the sausage is browned all over. Take the sausage out of the pot and set it aside on a plate. Drain most of the fat from the pot (leave some in to cook the onion). Cook the onion for 4 minutes or so, then add the flour to the pot and cook for a minute, stirring constantly. Add the chicken broth slowly and stir until the flour has completely dissolved. Add the canned tomatoes, garlic, and Italian seasoning to the pot. Also add the sausage back in. Increase the heat to high and bring the soup to a gentle boil. Once it's boiling, add the tortellini and reduce the heat so it's gently simmering. Cook for 5 minutes. Stir in the cream and cook for another 5 minutes. Season with salt & pepper to taste and serve immediately. Anything around the 17.6oz/500g mark for sausages will work fine; it doesn't have to be exact. Optional idea: adding a handful or two of fresh baby spinach during the last 5 minutes of cooking would be delicious and add some greens if you're missing them. Perfect comfort food! Leftovers may not be great 2-3 days out, but my soup would never be around long enough to find out! Haha I like your logic! It wouldn’t have lasted that long in my house normally either, but I think I made like 6 recipes for the blog that weekend lol. Thanks, Debs!! I made it without the cream and it was still fabulous! This looks so delicious, Natasha! And right up my alley for a weeknight meal – hearty, tasty and no fuss to prepare. Have you ever made this using frozen pasta? 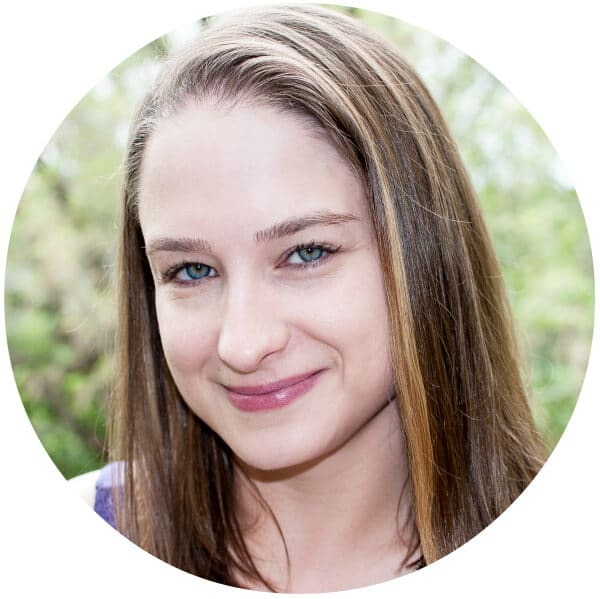 Hi Shannon! I haven’t, but I don’t see why it wouldn’t work. Maybe give it a few more minutes. You first published this like two years ago and still haven’t made it for me yet without sausage. Are you going to one of these days?? This looks so yummy Natasha and very healthy too. 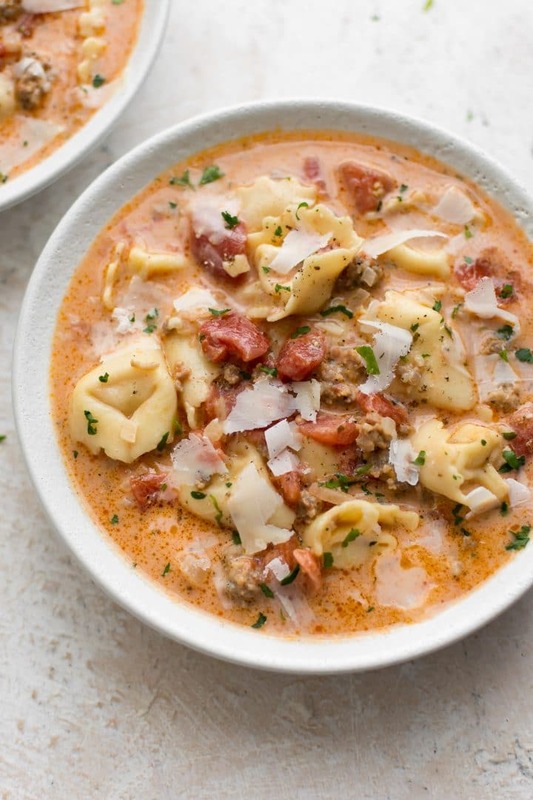 Can’t wait to try this Italian sausage tortellini soup. Looks delicious! There are many italian sausages i don’t get wich you Used. Is it salsicia? I just used regular pork sausage with Italian seasonings I got from Bulk Barn. Oh my Lord does this look delicious!!! Cooking for one over here. Just wondering if you know how well this freezes? Thanks, Nikki! Unfortunately, I find that tortellini just doesn’t freeze/thaw all that great when it’s in soup. It goes a bit mushy. I think that if you want to freeze it, it’s best to add the tortellini in later on. Just make the soup as normal (except for the tortellini part), portion it up, and then add tortellini as needed when you’re ready to eat it, and cook for the 8-10 minutes prior to serving. It was suggested to me that we have spaghetti for dinner the other night until I seen this dish in my email and I was like wait a minute… I actually have most of the ingredients to make this recipe and it turned out pretty good. I did substitute a few dry herbs for fresh and it was quite tasty. Even my kids (ages 11, 6 and 4) really liked it. Thanks for sharing.